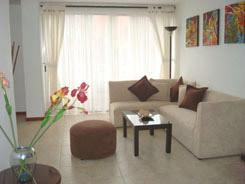 Our furnished Medellin apartments for rental with Kitchen, Bedroom, Living Room, Bath and Balcony, 2 Televisions with Cable, Computer with High Speed Internet, beautiful views of the city and close to the `Hottest` Areas of Medellin and more! Our Three Bedroom Apartment for rental is located in one of the best areas of Medellin and 10 minutes walking from our Office, Shopping, Restaurants, and a 10 minute walk to Oviedo Mall and Parque Lleras. * Metallic and glass small Dining Table with chairs in Balcony with Beautiful view of Medellin. * Master bedroom with Queen Size Bed, night stands (2), Brand new 21 inch Flat screen TV, Private bathroom. * Second & third bedrooms with new beds (1.90 mts x 1.40 mts) and 1 night stand, 17 inch flat screen TV. * Office room with Computer with Free High Speed Internet Connection. * Kitchen with refrigerator, microwave, washing machine, coffee maker and all Utensils. * Soccer and Basketball Court.